Doug and Maryanne James with Chloe on April 12, 2019. Photo by Valerie Osier. Maryanne and Doug (aka Tiny) James’ house was festooned with it’s-a-girl balloons and pastel decorations; the kitchen counter was loaded down with cookies, jelly beans and bubbly; and about half the living room floor was piled with gifts: high-end dog food, toys, blankies and a stroller for when the dogs decided to take advantage of the live-in chauffeur. 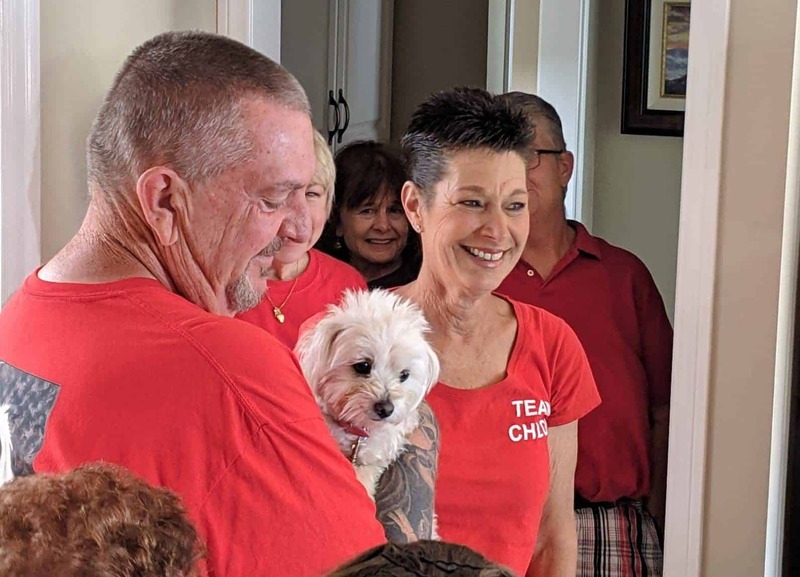 It was a sweet homecoming party to honor the first day of the rest of the lives of Chloe and Beatrice, two little dogs who’ve been through the wringer. Moving continually from physical embrace to sniffing feet to nosing around the outdoor patio and back into anyone’s arms were Chloe and her new sister—or, more fittingly, grandma—having the time of their lives. Beatrice is a poodle mix whom Fix Long Beach also fostered. She’d had extensive surgery, and all but four of her teeth had been extracted. Veterinarians estimated her to be between 8 and 12 years old, but she didn’t act her age as she skittered joyously across the James’ slick hardwood floors. 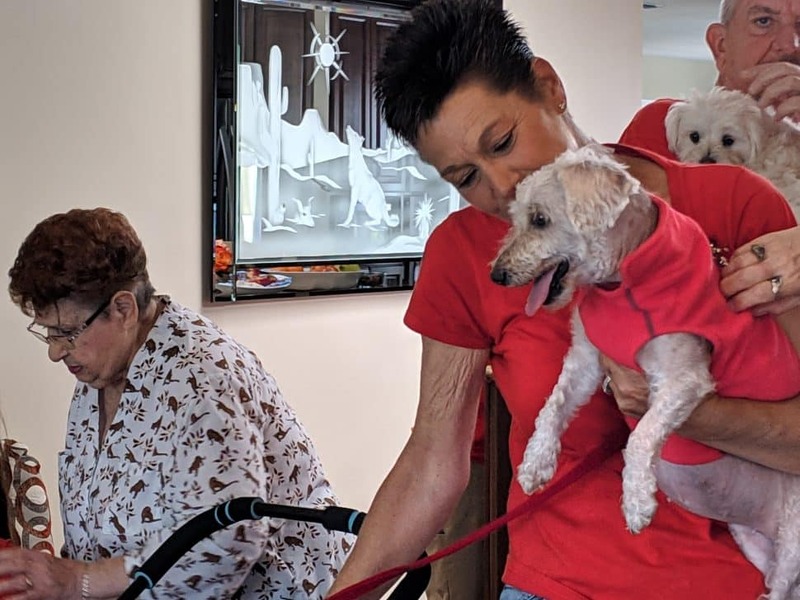 Maryanne James holding Beatrice, an elderly dog that was adopted alongside Chloe, on April 12, 2019. Photo by Valerie Osier. Chloe made national and global news in December as a victim of horrible animal abuse—“the worst case I’ve seen in 30 years,” according to a veterinary assistant. Fix Long Beach volunteers had brought her first to Primary Care Animal Hospital and then to Long Beach Animal Emergency to nurse her through her extensive injuries. She had an initially rough road to recovery that the Long Beach Post and other news outlets chronicled. Many members of the public clamored to adopt her, moved by the pain and humiliation that the little girl had suffered and quite possibly and understandably attracted by an element of celebrity. “Originally, we had 400 people who said that they were submitting applications, but as people filled them out and came to requests for referrals from the vet and other people, it weeded the number down to 75,” said Diana Kliche, president of Fix Long Beach’s board. Board member Pam Rainsdon said that the Jameses were selected from among several qualified applicants because of their dedication to Chloe’s situation even before it was determined that she was going to pull through. The couple had also cared for disabled pets. As of this writing, the abuser has not been identified; a $20,000 reward is still being offered for information leading to his or her arrest. Maryanne said that she and Tiny surprised themselves by their desire to adopt Chloe. They recently lost their dog Betty, who was abandoned in a backyard when she was a puppy. Unbeknownst to the Jameses, Betty wasn’t a healthy girl. During the time she lived with them, she lost one eye to surgery and went through multiple veterinary visits. The Jameses weren’t daunted by the medical bills, which totaled tens of thousands of dollars, but when Betty died, they were devastated. Anyone who’s truly loved an animal, though, knows that love isn’t finite. Shortly after Betty’s death, Maryanne and Tiny saw Chloe on the news. Earlier this month, Maryanne and Tiny were overjoyed when they learned that they’d been selected as Chloe’s new parents. Everyone wanted an audience with Chloe’s and Beatrice at their homecoming as they bounced between photo ops and sniffing after their own interests. Beatrice was having a ball, but it was Chloe who was the marvel. To look at her playing with Beatrice and wagging her tail at the human guests, you’d never think it was the same dog who would have perished in agony in a dumpster but for the intervention of a caring, unselfish community. “I can’t believe she survived,” one guest said as she watched the contented little dog. “This is why we do this,” an audibly choked-up Rainsdon. 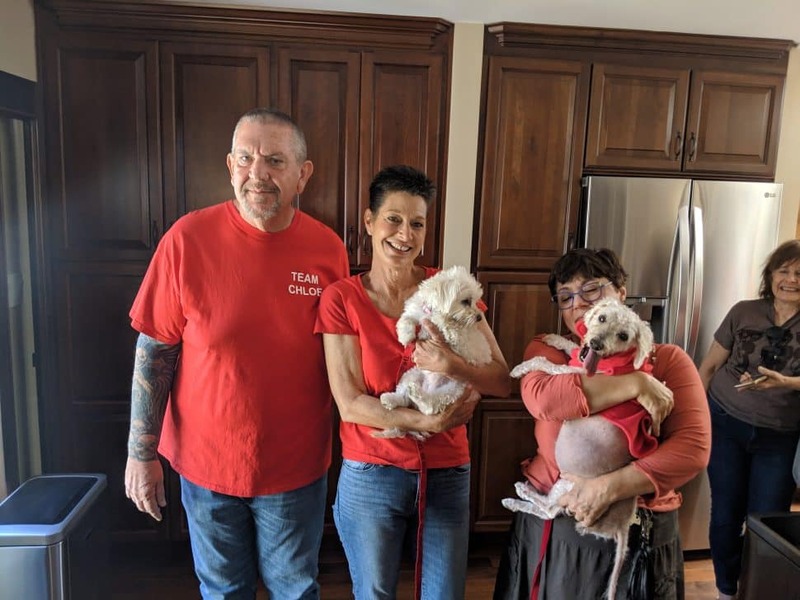 Doug and Maryanne James holding Chloe (left) and Susan Roe holding Beatrice (right) on April 12, 2019. Roe fostered Beatrice before she was adopted by the Jameses. Photo by Valerie Osier. Watch Chloe’s continuing story on her Facebook page. If you have space in your heart and home, adopt an unwanted pet in her honor.